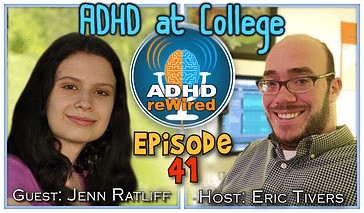 A college student studying the business of the music industry, Jennifer Ratliff joins us to talk about a variety of topics surrounding being a student while dealing with ADHD. From her time as a teenager dealing with substantial family, school, and life changes, to her later obstacles as a college student, Jenn’s story provides an interesting perspective. Topics discussed include the challenges of obtaining some prescription medications and their associated side-effects, learning accommodations made for students with ADHD, writing strategies, and more. Jennifer is a student at Belmont University in Nashville, TN. Studying business administration, she maintains a focus towards business in the music industry. She is a member of the ADHD reWired Facebook group. At age fourteen she was diagnosed with ADHD. Enjoys reading: she began reading at a younger age than she began to speak. Jenn began counseling at age fourteen during a time where her parents were in the process of separating and divorcing. Around the same time, she was about to make the transition from Catholic school to a public high school. The issue of ADHD was brought up because one of her cousins had it. Though her teachers had been given rating scales, their responses only notably mentioned that Jenn talked excessively. Since she didn’t begin speaking understandable words until age three, when she talks a lot now she just tells people that it’s because she’s catching up for lost time. Eric mentions that because ADHD is a developmental delay, many end up delayed for the equivalent of three years, though they do catch back up over time. Jenn’s first doctor seemed, to her, hesitant to prescribe medication. One listener of the show wrote to Eric about how challenging it was for her to receive an Adderall prescription for her son, as only certain psychiatrists, not his doctor, would provide them. It’s a common problem that many doctors refuse to prescribe Adderall. Eric: Many will talk a lot about those who abuse the medication, though many who actually need it have to go to extreme lengths to find it. Currently on Vyvanse, Jenn has experienced side-effects including weight loss (losing nine pounds in a month), sleep issues, and chest pains. Eric mentions his use of an ADHD reWired Coaching and Accountability Group partner to help him go to sleep on time. Freedom, an application that blocks potentially distracting programs on one’s computer, is very helpful to Eric. During college, when Eric received his diagnosis he had almost failed out, calling himself the “hardest working, least efficient student”. Eric plays an audio recording sent in by a school principal who was a part of the ADHD reWired Coaching and Accountability Group. He calls the last twelve weeks “a defining roadmap for his own self-confidence”. Most of the anxiety he once had is now gone. To help with her writing, Jenn tries to control her penchant for run-on sentences by circling every preposition in a given sentence and eliminating unnecessary ones. Jenn doesn’t often pre-write or outline her essays before writing them. Eric challenges her to spend a lot of time on her pre-writing process going forward. Eric: Pre-writing provides an opportunity to piece together one’s thoughts. Outlining is focused on just the key pieces of information by nature, so it should help to maintain focus when one would otherwise be unsure of what to write about next. Eric asks her to post both her pre-written work and completed essay for her next writing assignment to the ADHD reWired Facebook group. Mind mapping allows people to gradually connect otherwise tangential thoughts more easily to a central idea by mapping them out. It’s great for organizing prior to writing a linear essay. There’s a lot of neuroscience that suggests that the less we need to use our minds to recall information, the more brainpower we have to allocate to decision-making. Jenn usually keeps a lot of information, including her schedule, plans, and medication symptoms in her head. Eric suggests that probably makes her ADHD worse. Jenn’s psychologist immediately suggested she use a planner; now that she uses one, Jenn see a lot of the advantages. Jennifer does technically receive allowance for additional time on tests, but sometimes due to scheduling issues with other classes it becomes almost impossible to make use of. With another class, her professor seemed to suggest that there really wasn’t a place to go for extra time during tests. Eric: When he was in college, he only ended up using the offices given to him for extra accommodation once. Mostly, what he did was to talk individually with each professor before class in order to build relationships with them and work to provide accommodations within the class. He received more accommodations – sometimes within the class or at the professor’s office; always ask about what works for both of you. If you have longer term assignments, it is possible to have them broken up into smaller pieces, though Eric suggests talking with the professors and negotiating personally about working a system out. About to walk into your dorm with your hands full, you see a nice old lady struggling to open a door and needs help. At the same time, you notice an attractive young man doing maintenance work nearby who is about to knock over a can of paint without realizing it. How do you handle the situation? Imagine that you are managing a successful band. What is the name of this band and what is the name of their number-one song? If you had a pet penguin, what would its name be? If you’re in denial-land, get out. You have no idea what you’re missing. In life you should always get out of that space where you think you know better than everyone else. Listen to other people – sometimes they’re actually right. Jennifer is a member of the ADHD reWired Facebook group.